Customers of Fly Jamaica Airways Ltd. can now view the airline’s updated flight schedule for November 29th and 30th at www.fly-jamaica.com/updated-flight-schedule, in the wake of an incident Tuesday morning that resulted in its tail cone being ripped off. 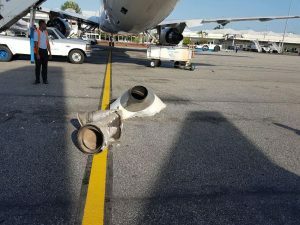 At approximately 07:20 hrs this morning at Cheddi Jagan International Airport (CJIA) in Guyana, Fly Jamaica Airways’ B767-300, which was parked at an assigned gate, was struck by the wing tip of a taxiing Caribbean Airlines (CAL) B737-800 aircraft. Fly Jamaica Airways’ B767-300 aircraft has been withdrawn from service, and the airline awaits the findings of the investigation currently being conducted by the Guyana Civil Aviation Authority (GCAA). The Directors and staff of Fly Jamaica Airways wish to reassure their customers that they are working assiduously to lessen the inconvenience caused by this incident, and to ensure that all of their passengers are accommodated in the most efficient and convenient manner. Fly Jamaica Airways remains committed to offering the safest service between all of their destinations, in the air and on the ground, and the continued safety of their passengers, flight crews and ground staff. For updated flight schedule information please visit www.fly-jamaica.com and click on the “Customer Advisory: Updated Flight Schedule” link at the top of the page. All further flight schedule updates will be published to this page.